The topline in your horse is one of the most important groups of muscles that supports the vertebral column, the rider and saddle, and facilitates proper movement in power. The topline in the horse is also one of the most underdeveloped muscle groups in a high percentage of horses. Take the saddle off of many high level competition horses and you will be witness to a weak topline, which then impacts that horse’s performance and soundness. Why is the topline so tough to build and what can you do to regain muscle and strength to that region in the horse? The topline in the horse refers to the groups of muscles trailing down the back or vertebral column from the withers to the lumbar region. There are really three main muscles of concern or focus including the trapezius, latissimus dorsi, and the longissimus dorsi, which are located on both sides of the body and interconnect with the goal of supporting and stabilizing the bony column of the spine. Why do many horses suffer from a poorly developed topline? How Do You Build the Topline in Your Horse? The topline in any horse is composed of muscle, plain and simple, and when there is a weak topline, this implies that the muscle is not well developed in size or strength. In order to build muscle, your horse requires proper nutrition, including protein, along with proper exercise conditioning. The muscle groups must be stimulated and nourished for hypertrophy to take place, which is muscle growth. Plain and simple. In many cases, you will see not just a weak topline in a horse, but also other muscle groups including the thigh muscles and shoulder region. Some also have other signs of nutrient deficiency including weak hoof capsule growth and ongoing tendon or ligament conditions. Bottom line, most of the time, it is not just the topline in the horse that is affected. For many horse owners, they see a weak topline and instantly reach for high calorie foods such as fats or carbohydrate ridden grains as being the solution. Although you will ‘create’ a topline, this is not often the result of muscle growth, but more so fat accumulation. This is not ideal but an illusion and nonfunctional for general support and strength. This is no different than if you desired to restore your own physique and build muscle or strength. It is basic science and all 3 elements must be present. You cannot have success with just one element and lacking in another. Proper nutrition in the horse is a huge debate and likely if you ask 10 different horse owners, veterinarians, or nutritionists, you will get 10 different answers. I have come to many conclusions myself regarding nutrition and our equine patients, with one main important one being that we, as a general consensus, make things much more complicated than is needed. The equine industry as a whole tends to rely more on ‘supplements’, which include ration balancers and vitamin/mineral blends, than they do on real whole-food. This then breeds and creates not only an ongoing desire for muscle strength, topline development, and overall physical fitness, but also contributes heavily to digestive health in the horse. When it comes to the topline and muscle strength in the horse, your horse will require nutrition and this is not just the basic macro- and micro-nutrients, but includes other beneficial co-factors which help to build and support the body. This is where whole-foods come into play and why I rely on them heavily in our program. Protein, including amino acids, is one macronutrient that is vital for muscle growth and topline development in the horse. When you look at the average forage diet, most hays being fed are lower in protein and generally at 10% or less. While this may be sufficient for some horses, it is not sufficient for others. In our program, we tend to feed alfalfa or an alfalfa/orchard grass mix, with an average protein level of 19% or higher, often exceeding 21%. I will say that based on experience, even when fed this legume mix at 2% of bodyweight, many of our off-track Thoroughbreds require and desire more protein. This is where the Cur-OST EQ Topline & Muscle formula will come into play, dosing each horse 1-2 times per day based on their needs. The 80% organic pea protein extract, combined with amino acids glutamine, arginine, carnitine, lysine, and creatine contribute nicely to their overall body condition and topline development. In addition, we see gains in hoof health, joint health, and quicker recovery from tendon and ligament injuries. Proper and well balanced protein is essential for the body, and the EQ Topline & Muscle provides what our patients need in most cases. You cannot feed an low protein hay or forage and believe you can supplement your way out of a problem situation. The topline and muscle development in the horse starts with a high quality core nutrition program, based on whole-food, then you can supplement with additional protein and amino acids. Most horses benefit from additional protein in their diet, if the protein source is whole-food, balanced, and easily digested. Some horses may experience problems which is usually due to poor digestive health in my experience, resulting in a ‘hotter’ personality or increased inflammatory problems in the joint and/or feet. Make sure plenty of water is available for horses on a higher protein diet, as water is needed to flush the system and remove excess nitrogen from amino acid metabolism. A higher protein diet can also lead to increased nitrogen excretion in the urine, which will produce more ammonia in the stall due to bacterial degradation. Digestive health is extremely important in the horse and impacts everything from digestion and nutrient absorption to inflammation and even behavior. Many horse owners simply do not see the importance of gut health in their horse, and this is what often is behind many horses with a weak topline and overall strength. The process of digestion is impaired by many factors ranging from the diet itself to stress and even medications that are routinely administered to the horse. All of these factors can either create a happy and balanced digestive tract or they can create a major problem area that is contributing to most of your horse health complaints. The bottom line is that within your horse’s digestive tract is a vast universe of bacterial and other organisms, referred to as the digestive microbiome, which assist with proper food digestion and nutrient absorption. In addition, this microbiome can either help to keep the general inflammatory status of your horse balanced, or it can swing that pendulum to the opposite side creating more inflammation. It is all about balance in the gut! If any of these symptoms are present, it may be wise to address and support digestive health in your horse. If the digestive tract is out of balance, then often, any nutrient provision you provide may not be properly utilized by your horse. Always a wise idea to address the gut first or in addition to an increased plain of nutrition when trying to build the topline and muscle development in any horse. My favorite supplements to address and support the digestive tract in the horse include Cur-OST EQ Tri-GUT or Cur-OST EQ Pro-GUT. You can provide the proper nutritional program, supplement with vital amino acids and protein, and even support digestive health in your horse, BUT, if you do not challenge those muscles, they will not grow. Exercise is important. In order to build a muscle, it must be stimulated to grow. Not just once but continually, increasing in the level of stimulation because the muscle will reach a point of adaptation, which must be overcome for continual growth. On that same note, you can put a lot of effort into exercise for your horse and produce a nice topline, but if you do not maintain that level of exercise, muscle loss will naturally occur. These groups of exercise not only stimulate the muscles in the back region, but also stimulate the core as a whole, which includes the abdominal muscles. Your horse requires both opposing groups for proper support of the spinal bony column. The horses are worked generally 3-4 times per week, increasing the program in intensity as the horse allows. How Long Does it Take to Build a Topline in Your Horse? Muscle growth takes time and in many cases, the horse’s overall body condition is lacking to begin with so all efforts applied initially often go into rebuilding the body as a whole. As the body rebuilds, from gut to general musculature, then you will start to see specific muscle groups becoming stronger and more defined. Depending on where your horse is in his body condition at the beginning will dictate the time required to build the topline specifically. If the horse is in good body condition initially, and all factors are applied properly, it is not uncommon to have subtle to major improvements noted in as little as 14 days or 2 weeks. If your horse is lacking general body condition and fitness, the time required could extend out to 8 weeks or longer. 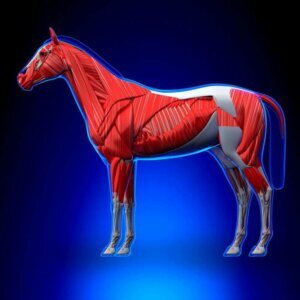 The topline in the horse is one of the most critically evaluated muscle groups visually and also one of the most important groups of muscles physically. Considering the high incidence of back problems in the horse from kissing spine lesions to sacroiliac pain, it just makes sense to support and build and support the topline. The effort applied is what often dictates what the end result will be in your horse. At Nouvelle Research, Inc, we are here to support you and your horse, not just with concepts, but clinical experience to assist you with your horse goals.